This morning, during a long and interesting discussion with dear old mum a preconception I had regarding my name was shattered. I always assumed I was named after my grandfather, great-grandfather and great-great grandfather who all had the same first name. Apparently not! I have the same name but it’s purely by coincidence. My parents just happened to like the name……. Some interesting family secrets were revealed. Or perhaps I should more correctly write that it’s information I didn’t know. On my mother’s side my great grandfather emigrated from the UK to Hawkes Bay province, NZ with his parents and 12 siblings (obviously no TV in those days). They arrived with many children and little else. One of the more wealthy local farmers took an interest in my great grandfather and offered to board and clothe him at no cost provided he laboured on the farm. One less mouth to feed for his parents. Apparently he did well, was intelligent and had a natural ability with horses. The mode of transport in those days. He was “home schooled” by the farmer and his wife until he reached his teens and then they paid for him to be a boarder at Te Aute College near Pukehou. The school was established in 1854 by the Anglican church to educate young Maori boys. The language was English during lessons and Maori at all other times. For most of the pupils Maori would have been their first language. Needless to say my great grandfather learned to speak Maori and my mother can remember as a young girl him stopping to greet Maori’s he knew with a hongi and would converse in Maori. His education, intelligence, and ability with horses, led to him establishing a stagecoach business as a young man. It was whilst delivering the Royal Mail to one of the larger and more wealthy farms that he met his future wife. Her family didn’t want her to marry “beneath herself” and when she did, they cut her off. Despite this she remained a lady and would have nothing socially to do with the local Maori, tradesmen, servants, etc. She was also a member of the local women’s temperance movement and great grandfather wasn’t allowed alcohol. At least in the house! He would take my mother out for a walk and have her wait outside the pub whilst he slipped inside for a pint leaving her a the “lookout” for his wife, should she walk that way. New Zealand might well have gone the same way as the UK with wealthy landed gentry owning most of the arable land in large estates. But in the late 1800’s the Liberal Party came to power on a platform of purchasing all the large estates (voluntarily or compulsory acquisition) and breaking them up into small holdings which were then either sold to arriving migrants or converted to Crown Lease land. So the nobles and landed gentry stayed in England; New Zealand received middle-class migrants, whilst Australia was sent the criminals! After a considerable amount of research I finally identified a suitable laptop replacement. The next step has been to find the best price. This resulted in an email query being sent to what appeared to be the best online supplier. The response to my query arrived two days ago and was in German. Now I don’t speak or read German so I tried using Google Translate. It did an excellent job of murdering the English language! Today I received a reply in Thaiish (Thai – English). However I’m slightly concerned about the possible condition of the received laptop as you can see from the message…. Thank you for contacting us and we would like to apologize for this inconvenience. The laptop will be imported from Germany and will be spread out in Milton Keynes. Hopefully this doesn’t mean I have to collect the components from various locations in Milton Keynes and assemble it myself! 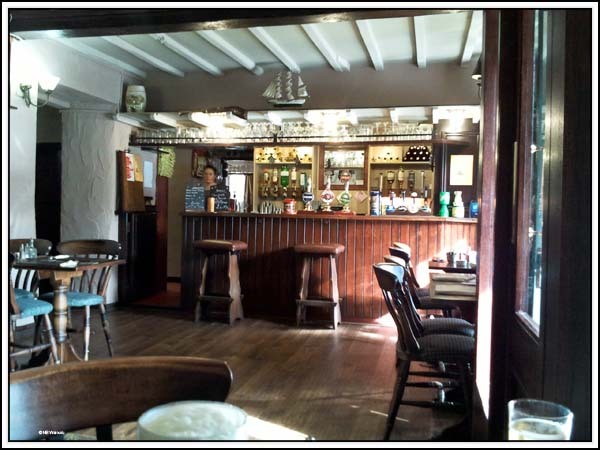 Sunday is roast lunch day and we went to the Old Plough in Braunston where Jan had the beef and I chose the pork. I won’t complain about the meal but the roast lunch at the Barley Mow in Newbold was better. I forgot to take the camera so the photos were from the mobile phone. Whilst walking back down the hill to the towpath we could hear the sound of a chainsaw. 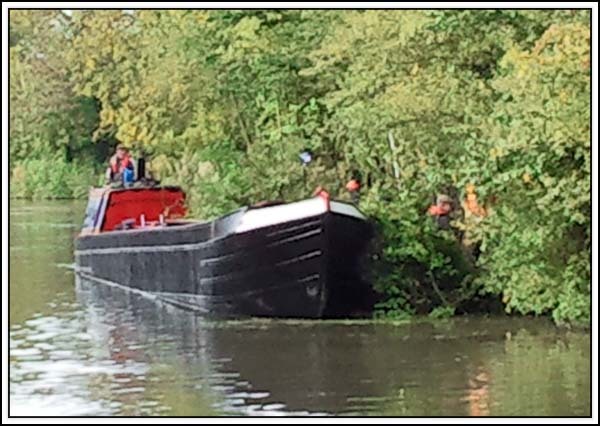 A team of CRT volunteers were cutting back vegetation on the “off-side”. There is a shallow punt between the working boat and the bank which the volunteers are using as a platform to further break-up the branches before transferring them into the boat. They appeared to be enjoying the physical activity! We have our own physical activity planned for tomorrow because, after five weeks, the toilet tank gauge is showing half full. The water tank also needs to be topped up but that can wait until after the pump-out. The logic being the bow will be higher and the pump-out tank is in the stern. After that we’re going to start moving back up north.